How to move a tree or a shrub ? Quite often, we find that a young tree is not in the right place. This can happen when we made a mistake regarding the position when it was planted or future works mean that it must be moved. In this case, it is best to move the tree as soon as possible rather than let it die. First of all you need to know whether it can be done or not. The required conditions for transplanting a tree are more rigorous than for an ornamental grass. The time of year is important with November through to March – April being the best. In the middle of summer, it is nearly impossible for a shrub to regrow if it has been pulled out with only balled roots in earth. The other factor to take into account is the size of the specimen. To have a chance of surviving, the root ball needs to be about equal in volume to half, that of the branches, which means quite a considerable weight to move! If the plant is too big then you will need to prune it, by cutting off half the branches' length. This is the only way you will be able to remove it with a root ball that is small enough. Shrubs that are relatively young, only a few years old will replant better than more established ones that have formed a larger root system. The Box is an exception to this rule: they quickly form new roots. Plants that like peaty soil such as Rhododendrons and Azaleas have a clumped root ball and are relatively easy to transplant. Roses that are less than 10 years old are easy to transplant and move in winter without a root ball. Trees can only be replanted if their trunk is less than 8cm in diameter at the base. Larger than this and their chances of survival are slim. Begin by pushing the spade in vertically to its full depth around the tree. If the earth ball risks falling apart, slide the tarpaulin to the hole. 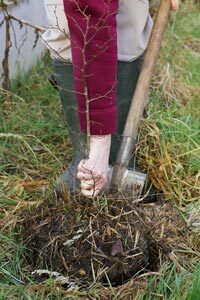 Begin by pushing the spade in vertically to its full depth around the tree, keeping it 30cm away (40cm in light soil) from the trunk. If it is a young specimen then the circle will be enough and it will be easy to push the tree over with the spade. For bigger specimens you will need to dig a trench that is 50cm deep outside the circle. Cut any roots that you come across with secateurs. Once the trench is finished, force the spade under the specimen to a depth of at least 40cm so to loosen it. This stage is very delicate because the roots must not be damaged by forcing the spade too much. Continue doing this around the subject until it can be pushed over onto a tarpaulin. Cut off the ends of any damaged roots. Cut back any branches if you have been unable to extract a big enough earth ball. Ideally, the branches should be twice the length of the earth ball diameter. Transport it to the place where it is to be replanted, the sooner the better. Think about digging the hole in advance to gain some time. 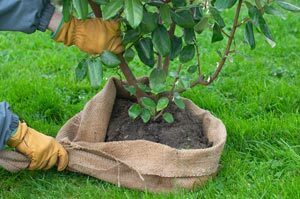 If the earth ball risks falling apart, slide the tarpaulin to the hole and ease the subject into the planting hole rather than risk lifting it up. Once planted, fill in the hole and water it well, the plant deserves your careful attention. Water it steadily throughout the first year following replanting. Do not give it any fertilizer until it is growing well. The specimen will often not flower in the year that it is replanted or just after but it will quickly catch up.